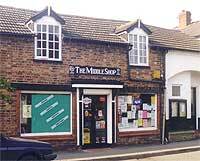 The Middle Shop is the village Post Office, Newsagent and shop, it provides a good selection of of various publications. It also carries a wide and varied stock of groceries and many other useful items. The staff are very pleasant and have a vast amount of local knowledge. "Heads Above" the hairdressers is situated at the Old Smithy on Whitchurch Road.